After a three-game winning streak, the Maroons (6–12, 2–5 UAA) ran into tougher competition this past weekend, falling 56–41 at Case Western (12–6, 4–3) and 76–68 at Carnegie Mellon (11–7, 3–4). A poor shooting percentage, which has plagued Chicago this season, was the Achilles’ heel again for the Maroons last weekend. The team shot 26.8 percent against Case and 26.4 percent against Carnegie. On Friday at Case, the Maroons grabbed an early lead but let the home Spartans pull away 32–22 at half following an 18–2 run. Chicago didn’t make much headway in the second. Case held the lead the rest of the way, pulling out a 15-point victory. In addition to shooting, Chicago struggled to hold onto the ball, coughing it up 25 times. 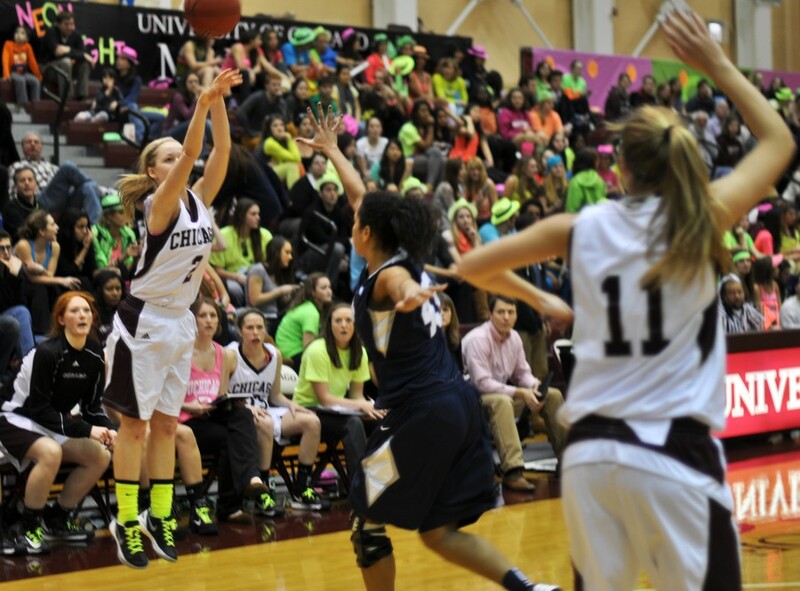 The Maroons were led by first-year Paige Womack (13 points and three rebounds). “Their guards pressured us full court defensively, making it hard for us to get in a rhythm and comfortable in our offensive sets,” Womack said. On Sunday, the Maroons started off similarly against Carnegie, snatching an early lead but quickly losing it. They found themselves down 35–26 at half. The second half was a different story. Carnegie had a 13-point lead, but the Maroons fought back and even went up 58–57 with four minutes left—thanks to two free throws by Womack. Unfortunately for the Maroons, Carnegie knew how to finish the game. Tied at 61 with 2:45 left, the Tartans went on an 8–0 run and never looked back, winning 76–68. Chicago was led by second-year Claire Devaney (14 points and 14 rebounds) and first-year Caitlin Moore (13 points and 10 rebounds). Moore says the key was free throws. The Maroons had success on the glass, which was certainly a promising sign. The visiting Maroons won the rebounding battle 46–38 against Case and 59–48 against Carnegie, achieving a season high in Sunday’s game. However, Chicago struggled with turnovers against Case and converting free throws against Carnegie (60 percent as a team), along with field goal percentage all weekend (26.6 percent between the two games). Despite these poor statistics, Chicago has received strong play from first-years, most notably Womack and Moore. Womack has averaged 11.2 points and 4.8 rebounds in her last six games. Chicago plays again at Ratner against the same set of teams this weekend, Case on Friday at 6 p.m. and Carnegie on Sunday at 2 p.m.